The perky Lydia Villers is determined to leave behind her life as a social butterfly and do what she's always dreamed of doing, pursue a career in natural philosophy. A shame the only scientist available to assist her is the one man she had once hoped to wed. 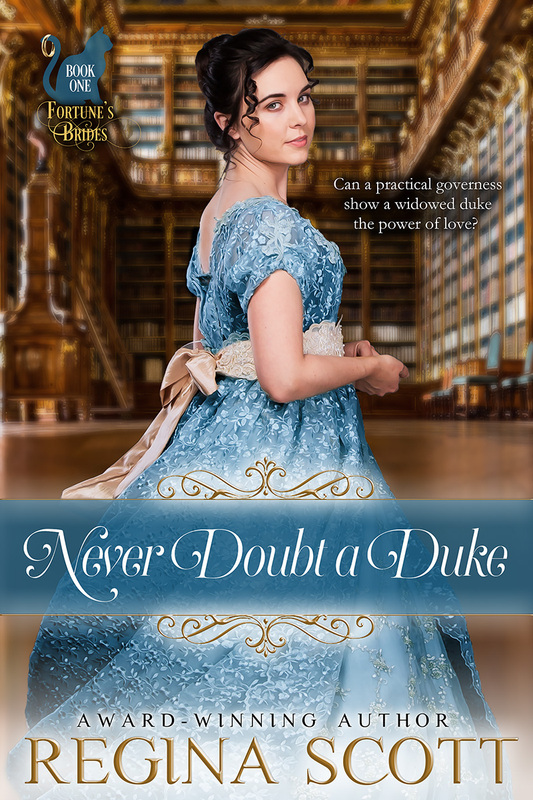 The brilliant Frederick, Viscount Worthington, Worth to his friends, has been betrayed once too often, including by the bubbly beauty who now wants to work at his side. How can he believe Lydia's intentions are true this time? After all, someone is intent of sabotaging his efforts. But with the help of Miss Thorn and her beloved cat Fortune, an enthusiastic young lady and a wary lord might just discover that only together do they make the perfect chemistry. 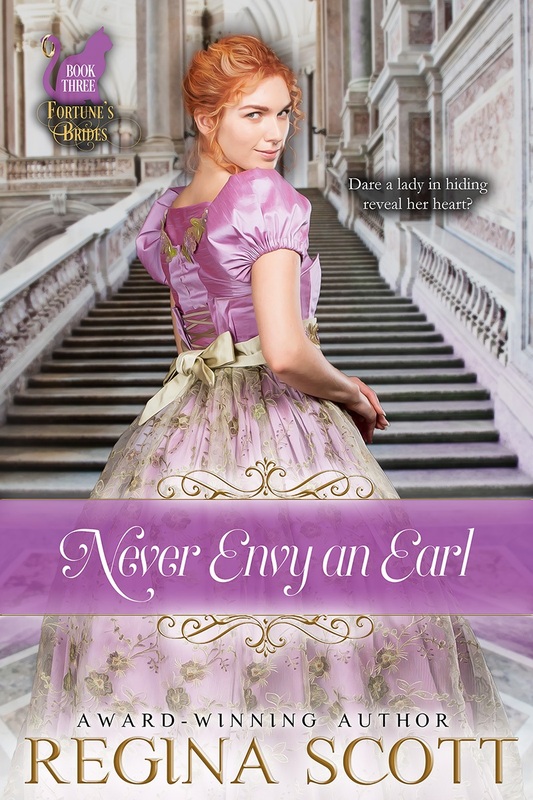 This sweet, clean Regency romance is the sequel to Never Envy an Earl. Fortune's Brides: Only a matchmaking cat can hunt true love. A townhouse had never looked so daunting. Lydia Villers stood on the pavement looking up at the four-story white row house situated on fashionable Clarendon Square. Her muslin dress had seemed light and airy when she'd donned it that morning; her pink velvet Spencer hardly needed for the warm day. Now she felt perspiration trickled down her back. "It is the best situation for your goals," Meredith Thorn reminded her. Lydia glanced at her companion. Oh, for an ounce of that confidence! Meredith, owner of the Fortune Employment Agency, always looked in complete control of herself. Perhaps it was the sleek black hair, so unlike Lydia's pale ringlets. Or the depth of her lavender eyes, the color so much more compelling than Lydia's misty green. Or maybe it was the grey cat in her arms, gazing serenely at Lydia as if she didn't doubt Lydia was capable of winning over anyone who stood against her. Lydia drew in a breath. Her family and friends had consistently commented on her sunny smile, her optimism and enthusiasm. She should not allow the fear of one man to dim her light. "You're right," she told Meredith. "Let's go." Meredith nodded in satisfaction. Her cat Fortune's tail swung like a cavalry flag as they moved forward. A man answered their knock on the green-lacquered door, and Lydia could only marvel at his size in his sturdy brown coat and breeches. He took the card Meredith held out in one massive ungloved fist. "We'd like to call on Miss Worthington, if you please," Meredith said. "We've come about a position." His brown-eyed gaze traveling over Meredith and Lydia and lit on Fortune in Meredith's arms. A smile tilted up, making him seem approachable. "Come in and wait. I'll see if Miss Worthington is receiving." Rather direct for a footman. As he ambled off, Meredith and Lydia stepped into the entry hall. It was not the most remarkable place, for all the work in this house had the chance to change her life. The painting of a ship in full sail still graced one of the light blue walls. Like it, she felt the wind pushing her to new horizons. The gilt-framed mirror and half-moon table still stood opposite, the reflection in the oval glass showing her a bit paler than usual, her eyes luminous. The only thing to give her pause was the gentleman's tall hat and ebony walking stick laying across the polished wood surface. She swallowed. She would not be working for him. Not directly. She had to remember that. 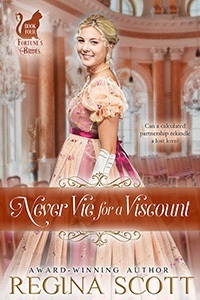 If she never saw Frederick, Viscount Worthington, again, it would be too soon. The footman returned and tipped his head to the corridor on the right of the stairs. "This way, if you please." She knew the layout of the house. He was no doubt taking them to the withdrawing room at the back. It was a pleasant space, done in shades of rose and blue, with a settee in front of the wood-wrapped hearth and a few chairs scattered about. The Worthingtons entertained rarely. Far too busy with more important matters. Charlotte Worthington was sitting at the walnut secretary along one silk-draped wall when they entered. Setting down her quill, she smiled at them. Lydia had always admired her. Like Meredith, she was cool, confident. She tended to speak her mind, even if she knew how to coat vinegar with honey. Only her auburn hair, coiled up in a bun at the back of her head with tendrils escaping along her sculpted cheeks, was at odds with her polished demeanor. "That will be all, Bruiser," she said. Bruiser? The footman didn't show any signs of resenting the rough name. He nodded and withdrew, leaving the door open behind him. Charlotte rose and swept toward them, grey lustring gown glinting in the sunlight coming through one velvet-draped window. Fortune sat taller in Meredith's arms as if ready to welcome her. "Miss Thorn," she acknowledged. "And Miss Villers. What an unexpected pleasure." Another time, in another situation, it might have been a pleasure to see Charlotte again. She'd been polite, even friendly, the one other time they had met since Lydia had returned from her sojourn in Essex. Why? Charlotte's brother could have made no good report of Lydia. He'd been the one to sever all acquaintance, as if she'd developed some dread disease. She shook off the thought and dipped a curtsey. "Miss Worthington. Thank you for receiving us." "Of course. I want you to know you are always welcome in this house." She was? Straightening, she gazed at Charlotte in wonder, but those deep grey eyes did not suggest a lie. Still, Lydia could not embrace that truth. "Please, have a seat," Charlotte said, going to sit on the settee. "Would your pet like a cushion?" Meredith drew a hand along Fortune's back. "Fortune prefers to stay with me. But I appreciate the offer." She sat on the closest chair and nodded Lydia into another nearby. "I won't take much of your time. I understand you're looking to add a member to your team." Charlotte glanced between the two of them as if she wasn't sure who was being offered. "I had just begun making inquiries. Did you know of someone?" "Yes," Lydia said, pausing to take a deep breath. "Me." Charlotte's russet brows rose. "I wasn't aware you were interested in scientific pursuits, Miss Villers." Few knew. She'd always loved learning about discoveries. When she was little, she used to sit on her father's knee in his study as he read aloud from Philosophical Transactions, the journal of the Royal Society. After he'd died, she'd made sure the subscription continued, devouring the latest advances in science, medicine, and technology. How thrilling to read how scientists like Humphrey Davy, Sir Nicholas Rotherford, and William Herschel were pushing back the boundaries of chemistry, peering into the recesses of space. She'd begged her brother to take her to one of the Thursday lectures of the learned society, but he'd been appalled by the very suggestion. "Never speak of this unseemly fascination outside this house," Beau had ordered, glaring down his long nose at her. "They'll think you a bluestocking." A bluestocking. A far too educated woman. The term conjured up spinsters gathered over tea, clucking like hens, dreams of husband and family supplanted by second-hand accounts of scientific pursuits. That wasn't her. She was destined to marry well. Beau had promised her parents before they'd died that he'd make sure of it. And so she'd tried. She'd danced and flirted, played the piano at far too many musicales, endured dozens of drives through the park. At Beau's insistence, she'd shoved herself at every titled gentleman on the ton. Several had shown interest. She knew how to dress and bat her lashes and appear suitably winsome, after all. She knew how to play the game, appear more interested in the color of their waistcoat than their discussions of politics and advancements. But no matter how much she flattered their consequences, none had felt compelled to offer. Even the one she'd prayed would offer. Now she squared her shoulders. "I am very interested in scientific pursuits, Miss Worthington. I've spent the last six weeks working closely with Augusta Orwell as she developed a formulation to heal skin conditions. I understand the properties of various substances-animal, plant, and mineral. I am fluent in the actions of various change agents like heat, light, water, and air." "Miss Orwell would be delighted to provide a reference," Meredith put in. Charlotte leaned back, gaze uncompromising. "We work long hours. There's little time to socialize." Lydia smiled. "Excellent. I no longer need to socialize." "So you are off the marriage mart?" Charlotte challenged. That was the one question she was thoroughly confident in answering. "Absolutely. I plan to devote myself to the furtherance of science." The male voice behind her sent a shiver from her, and her breath left with her confidence. Her head swiveled of its own volition. Hair as smoldering as his sister's, cut long enough to brush the collar of his coat. Eyes as grey but brighter, suggesting a spark of starlight within. Today he was dressed in a simply navy coat and fawn trousers. Beau would have known the name for that fold in his cravat. The Mathematical? How suitable. Anyone looking at that slender physique, that high head, would think him no different than any other gentleman on the ton. She knew better. She could not move, could not speak, as the viscount she'd once vied for moved into the room. Frederick, Viscount Worthington-Worth to his friends and family-stared at the vision of loveliness seated on the chair across from his sister. That silky blond hair, those big green eyes, the curves outlined by her fashionable gown. Lydia Villers, in his home? He'd never thought to see it again. But he couldn't believe the preposterous story any more than he'd believed she'd actually cared for him, not after he'd learned the truth about her. "Worth," Charlotte said, an exasperated tone creeping into her voice. "I hadn't realized you were home. This is Miss Thorn, of the Fortune Employment Agency." The other woman, a regal female with a stylish lavender-colored gown and raven hair, swiveled to meet his look. He inclined his head in greeting, and his gaze lit on the grey cat in her lap. A handsome creature. The blaze of white down its chest made it look as if it was wearing a cravat. He couldn't help his smile. "Miss Thorn, a pleasure," he said. "And I'm delighted to meet your companion as well." "Surely you remember Miss Villers," Charlotte chided. "Of course I remember Miss Villers," Worth said, refusing to look at the woman who had broken his heart a year ago. "I believe your brother is referring to my other companion," Miss Thorn said with a smile. "This is Fortune, my lord. Fortune, meet Viscount Worthington." He bowed, straightening to find the cat regarding him with interest in her copper-colored eyes. 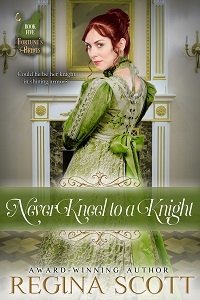 Miss Thorn relaxed her hold, and her pet dropped to the carpet and padded up to him to twine herself around his boots. "She likes you." Lydia sounded shocked. No more shocked than he'd been to hear her proclaim a love for science. But then, that was part of her charm-her unbridled enthusiasm for everything. He'd let it sway him before, convinced himself what she felt was real, unique to him alone. He knew better now. People tended to let you down. Animals were different. He squatted and put out his hand, allowing Fortune to sniff at his gloved fingers. She arched her back, inviting his touch, and Worth ran his hand gently along the fur. "I see that Fortune is a highly discriminating creature." "She is," Miss Thorn agreed. "She approves of you almost as much as she approves of Miss Villers." Perhaps not so discriminating then. Or perhaps Lydia had taken in the gentle creature as well. He straightened. "Nevertheless, I believe we are fully staffed at present." Charlotte was frowning at him. "We need one more to achieve your timetable, and you know it. Miss Villers has been working with Augusta Orwell. She has experience." "A shame stillroom work rarely equates to scientific rigor," he said, trying to keep his voice and look kind. Lydia swept to her feet and turned to face him fully, and he took a step back from the intensity blazing from her eyes. "Our work," she said, moving toward him, "may look simple to a man of your letters, Lord Worthington, but we follow the scientific method laid down by Bacon. We observe that certain elements appear to affect healing. We hypothesize that a particular ingredient may be beneficial to that process." With each step in the process she described, she advanced, and Worth retreated. "We devise experiments to test its efficacy both alone and in combination with other ingredients. We measure response, attempt to replicate the experiment, and see if we gain similar results. We document our findings. Our work may never be published in Philosophical Transactions, but the formula we recently developed has been evaluated by other apothecaries and found to have merit. It will shortly be sold on the market to help others. Can you say the same of your work?" His back was to the wall, literally and figuratively. His best application, the result of years of painstaking experimentation and documentation, had been stolen by a colleague who had claimed all credit. That's when he'd first learned the pain of betrayal, even if hers had hurt more. "Perhaps my brother questions your dedication rather than your credentials," Charlotte said. Over Lydia's head, he could see that a smirk had replaced her frown. She was enjoying this, the brat! "Six weeks is a short time to be involved in scientific pursuits," she qualified when he shot a glare in her direction. Lydia drew herself up, until her pert nose was pointing at his chin and he could see deep into her eyes. "Six weeks laboring from breakfast until long past dinner. I'm not afraid of hard work, when it had a purpose." Miss Thorn rose and came to collect her pet, who had retreated with Worth to the wall near the hearth. Fortune gazed up at him as if she expected him to make the right decision. Would that he knew what that decision should be. Charlotte was right-their timetable was tight. He had promised the Prince Regent to have something for review by the end of May. He was so close! Another pair of hands, another mind focused on the task, might make all the difference. And if he accomplished what he'd set out to do, he'd be able to hold his head up among his peers again. "Miss Villers has already made significant sacrifices to pursue a career in the sciences," Miss Thorn said, bending to pick up her pet. "She has left her position in Society, defied her brother." Interesting. Beauford Villers had been instrumental in introducing Worth to Lydia. He had always thought the fellow would be over the moon had his sister and Worth married. Did he still insist that she wed? "Most women of our class face persecution when stepping away from traditional roles," Charlotte acknowledged. She knew. She had suffered unkind comments from Society's reining belles, slights from former friends. He was thankful she had chosen to remain at his side, help him achieve. There wasn't much he wouldn't do for his sister. Except perhaps hire Lydia Villers. "I don't care," Lydia said, chin in the air. "I was ill-suited to the traditional role. I don't miss it." Now, that he could not believe. Everything about Lydia Villers-from the artful ringlets framing her piquant face to her frilly muslin gowns and normal exuberance-was designed to appeal to a gentleman seeking a bride. She had certainly appealed to him. He was more than a little chagrined to find she still did. "So, what do you want?" he asked. She beamed up at him, the sun coming out after a storm, lifting his spirits despite his reservations. "I want to learn more-how things work, why they function as they do." Her voice rang with determination. "I want to expand the boundaries of knowledge, discover great things that help others." She flung out her arms as if she would embrace the world. "I want to cure disease, double the food supply, soar beyond the stars." She dropped her hands. "Surely that's not too much to ask." Not in the slightest. The same longings pushed him. How had she known the one thing that might sway him? Was he that obvious? Was this a trick? He glanced to his sister, unable to speak. As always, Charlotte knew his mind better than he did. She rose, serene in her grey gown. "Well said, Miss Villers. I believe you will get on famously with the rest of the team. When can you start?" Remember the other books in the Fortune's Brides series.